You know the scenario. You need to get a message out to a lot of people—the baby’s here, bring your own beer, that sort of thing—but you don’t want to drag dozens of contacts into a spammy, reply-all messaging nightmare at the same time. No matter what your preferred communication app of choice, here’s how it’s done. 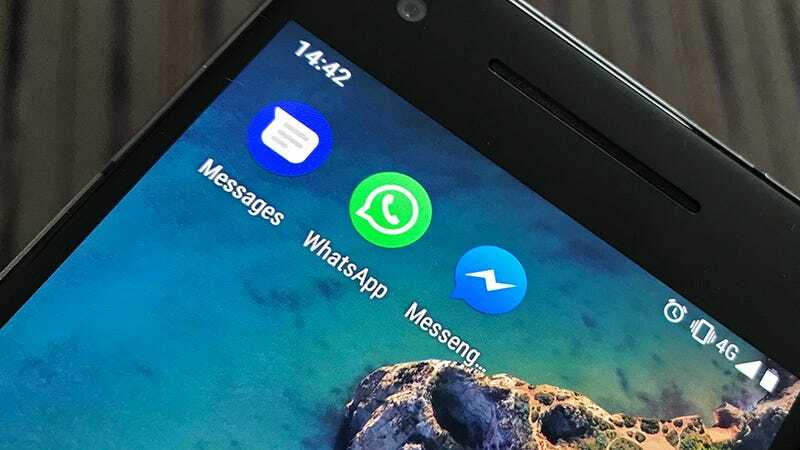 If WhatsApp is your preferred messaging platform, you’re in luck, as it features a very handy option called Broadcast. This beams the same message to a selected mix of contacts, but keeps all those messages separate, and you can even save particular lists of people for particular occasions. From the front screen of the app, tap the menu button then New broadcast. Pick your recipients, type your message, and you’re done—the message appears like a normal message in your regular conversation windows, and subsequent replies are kept private. The initial broadcast appears as a separate entry in your chat list, but the same message is duplicated in all the individual threads you’ve already got going with these contacts too. There is one caveat: You can only broadcast messages to people who have your number saved in their phone’s address book, otherwise they won’t be received. If broadcasts aren’t getting through, that might be the reason why. Tapping on the new message icon (bottom right) and then picking New group is the option you want to avoid, assuming you don’t want to kick off a thread where everyone can see what everyone else is saying. If you get pulled into a group against your wishes, open the thread, tap the menu button (top right), then choose Group info and Exit group. The Messages app on iOS handles group chats differently depending on whether the recipients of your communication are all using iMessage, or all using SMS, or a combination of the two. The only way to specifically avoid a group chat and force individual SMS messages to be sent out is to switch off both iMessage and MMS. From Settings tap Messages, then toggle both iMessage and MMS Messaging to off (you lose all the advantages of iMessage, like end-to-end encryption, at the same time). You can then go back into the Messages app, and create a new message for multiple recipients without starting a group chat. Your initial message is kept in a separate conversation thread, but any replies get routed to individual chats instead. Several apps can also help here, despite the restrictions iOS puts on third-party access. The best we’ve found is Reach, which works with iMessage or plain SMS, and can even personalize each message for you—you do have to press send for each message you want to push out (because of those restrictions we just mentioned), but it’s a lot more convenient than copy and paste, and means all your conversation threads stay organized. To duck out of a group chat thread that you’ve found yourself pulled into in Messages for iOS, go into the thread and tap the information button (top right). Scroll down and tap Leave this Conversation and you’re out. If you don’t see the option, it means at least one of the participants isn’t using iMessage. The default Android Messages app for SMS actually handles group texts without creating a group chat—in other words, the default action is to ping people individually when you select multiple recipients for a message. Just tap the plus button (bottom right) on the front screen, then select the contacts, then type out your message—you won’t accidentally create a hot mess of a group chat. As in Messages for iOS, the message you send out creates a new conversation thread, but the SMS is also duplicated in the threads you have with each individual contact, and any replies are kept in those one-to-one threads as well. It’s slightly cleaner than the way iOS does it but you’ll still see a group created in your list of chats (long press on the group SMS entry and tap the trash can icon if you want to get rid of it). Plenty of third-party SMS apps will do the job for you on Android as well. Pulse SMS is one that’s caught our eye lately, and can make your texts available on multiple devices for a small fee (it’s free to use on your phone). Again, just tap the plus button to start a group text—like Android Messages, replies get sorted back into individual threads, though in this case the original text message isn’t copied over and sits in a thread on its own. Chomp SMS is an old favorite too. Here you need to specify the mode you want to use before creating a group: Tap the menu button (top right), then Settings, then pick Group Chat Mode and choose SMS. The option you want in this case is Replies go only to you (SMS), otherwise you’ll create an MMS thread where replies go to everyone. Not every app has a handy feature for sending one-to-many communications, so if you’re using something other than the apps we’ve already mentioned, you may have to take the traditional cut and paste route. Time consuming sure, but not too bad when you get into the rhythm of it, and only have a handful of people to message rather than a hundred. In Facebook Messenger, for example, long press on a message then tap Copy. Back out of the current thread, dive into another one, then double-tap (iOS) or long press (Android) inside the message box and pick Paste from the pop-up menu. This is the least convenient option of the lot but it’s certainly clean and tidy—it’s almost as if you typed out each message individually. All of your conversation threads stay intact and in order, and of course if anyone replies to one of your messages, those replies are kept private in their own threads. Double-check in whatever app you’re using first though—our favorite encryption messaging app Signal always creates group chats for multiple recipients, whereas something like Viber has a broadcast feature just like WhatsApp.